The arrow points to an ancient "bomb sag" on Mars, a crater produced when a Martian rock blasted into the air by a volcanic eruption 3.5 billion years ago fell back to the ground. A new look at an ancient volcanic blast on Mars suggests that the Red Planet was much more Earth-like billions of years ago, with abundant surface water and a relatively thick atmosphere, scientists say. The air on Mars was likely at least 20 times denser 3.5 billion years ago than it is today, researchers said. Back then, they added, the Red Planet's atmosphere likely helped sculpt and shape the planet's surface, much like Earth's atmosphere does today. "Atmospheric pressure has likely played a role in developing almost all Mars’ surface features," said study lead author Josef Dufek, of the Georgia Institute of Technology, in a statement. "The planet’s climate, the physical state of water on its surface and the potential for life are all influenced by atmospheric conditions." Currently, the atmosphere of Mars is less than 1 percent as thick as that of the Earth. 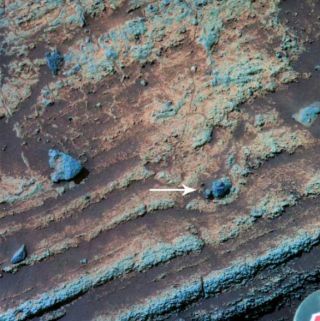 In 2007, NASA's Spirit rover took a closer look at the embedded fragment, giving Dufek and his colleagues enough information to determine the size, depth and shape of the bomb sag. The team then went to the lab to generate some bomb sags of their own. They created beds of sand using grains the same size as those observed by Spirit, then launched particles of varying composition at different speeds into the beds. Some of the sand beds were dry, some were damp and some were saturated. Whatever their composition, particles propelled into the saturated beds consistently produced bomb sags similar to the one Spirit studied on Mars, researchers said. The team also determined that lab particles must hit the wet sand at a speed less than 90 mph (144 kph) or so to create penetration depths similar to the Martian bomb sag. In order for a rock to move at such speeds through Mars' atmosphere, the air would have to be at least 20 times more dense there than it is today, researchers said. "Our study is consistent with growing research that early Mars was at least a transiently watery world with a much denser atmosphere than we see today," Dufek said. "We were only able to study one bomb sag at one location on the Red Planet. We hope to do future tests on other samples based on observations by the next rover, Curiosity." NASA's 1-ton Curiosity rover is due to land at the Red Planet's Gale Crater on the night of Aug. 5. Curiosity's main task is to determine if the Gale Crater area is, or ever was, capable of supporting microbial life. Dufek and his colleagues published their results recently in the journal Geophysical Research Letters.